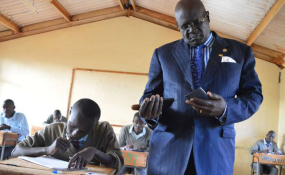 George Magoha oversees a KCSE examination at Sawagongo High School in Siaya on November 13, 2017. Education Cabinet Secretary designate George Magoha's net worth is Sh250 million, a parliamentary report has revealed. Prof Magoha was nominated by President Uhuru Kenyatta to replace Amina Mohamed in the Education docket said his annual income is derived from Treasury bills, fixed cash deposit, rent, income from a Safaricom mast and royalties from sale of his autobiography. If approved, he will join a Cabinet comprising multi-millionaires, including Water minister Simon Chelugui who early last year was worth Sh796 million, Ukur Yatani (Sh295 million), Peter Munya (Sh264 million) and Farida Karoney (Sh200 million). "He estimated his financial net worth at Sh250 million," the committee on appointments chaired by Speaker Justin Muturi said in its report on Prof Magoha. "His sources of income during the calendar year preceding his nomination and the current calendar year comprise of continuous annual income from Treasury bills, fixed cash deposit, rent, income from Safaricom mast and royalties from continual sale of his autobiography"
The report, which was tabled by Leader of Minority John Mbadi, recommends the appointment of Prof Magoha to the Education docket. The committee said no memoranda were presented to the committee contesting the suitability or otherwise of the nominee for appointment as CS for Education. The MPs found out that Prof Magoha, a professor of surgery at the University of Nairobi with more than 31 years experience, has a suitable academic and professional record to manage the Education docket. The MPs noted that Prof Magoha has not been dismissed or otherwise removed from office for contravening the provisions of Article 75 of the Constitution. "He has also not been adversely associated with practices that depict bias, favouritism or nepotism in the discharge of public duties," said the report. "He has fully complied with the tax obligations to the State for the financial year immediately preceding his nomination for the appointment."